"Hello? Commissioner? Do what to a rabbit?" If you pick up the phone in Dangeresque's office, one of the responses has Dangeresque receiving a phone call from the commissioner. 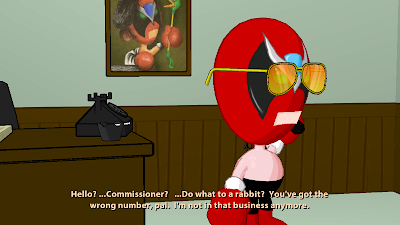 It turns out the commissioner from Sam & Max dialed the wrong number, because Dangeresque asks him that he wants him to "do what to a rabbit?" Dangeresque then tells the caller that he's "not in that business anymore".